PRE-ORDER WHY WE LOVE STAR WARS! Celebrate the greatest saga ever told: All of us who are deeply influenced by the epic saga of Star Wars have our favorite moments. Each time the screen goes black and you see those words― “A Long Time Ago, In A Galaxy Far, Far Away”―the music blasts through you and you’re a kid again. Ken Napzok, expert appreciator of Star Wars, counts down each one of those special moments that makes this series not just the best movies of all time, but the Greatest Saga Ever Told. ​Become a scholar of Star Wars: What began as one movie about good people, evil oppressors, and the space wizards that stood between them has exploded into a franchise. The moments that continue to inspire are on screen and in the pages of novels. They are found in the panels of comic books and among animated sequences on television. And they all continue to grow in stature, importance, and myth through discussions, debates, and daydreams. Why We Love Star Wars: The Great Moments That Built A Galaxy Far, Far Away is a shared story of fandom. “Reading this book I discovered that Ken not only has the beard of Obi-Wan Kenobi but also the storytelling flair of C-3PO, and he had me hanging on his every word like an Ewok. This is the Star Wars book I’ve been looking for.” - Jamie Stangroom, director - The Empire Strikes Door. 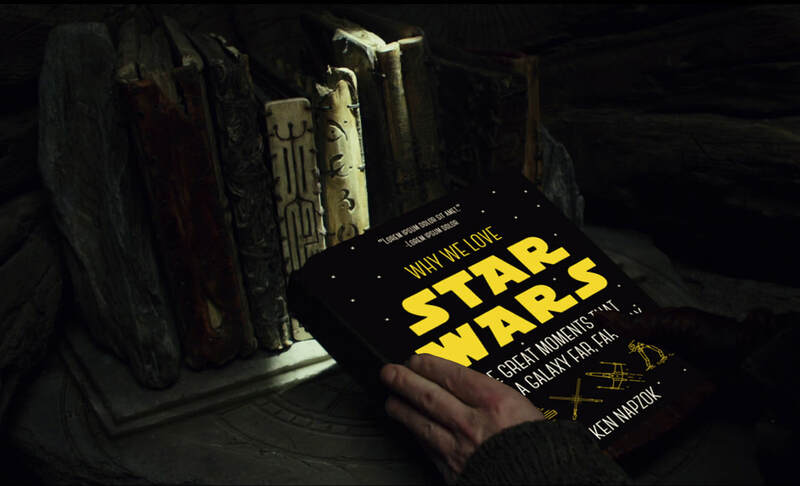 Why We Love Star Wars is THE book for the Star Wars fan… the new fan, the young fan, the old fan, even the fans who have yet to discover the magic. Ken Napzok reminds you, again, of the magic of Star Wars discovered as a kid and later, put into practice as an adult. Its dissection of themes, its playful ability to expand on what you already know, and its capableness to teach you even more proves this is the quintessential book on Star Wars. It also reinforces one truth: Star Wars is for everyone. - Mark Reilly, writer/ producer/ host of The Reilly Roundtable. "Even though this book isn't about the show, Get a Life, I still learned a lot about Star Trek. Plus, Ken has dirt on me so I felt this quote might appease him" - Nathan Hamill, Artist, Teek enthusiast, star of The Phantom Menace and The Last Jedi. “Hosting the Jedi Alliance podcast with Ken Napzok for 30 glorious episodes forged some of my happiest Star Wars memories. He was the master to my padawan, the light to my saber, the hand wave to my “you don’t want to buy any death sticks.” Ken was born to write this book and to shine a tractor beam of light on his limitless love for the franchise.” - Maude Garrett, host/ founder GeekBomb and Whut fashion.